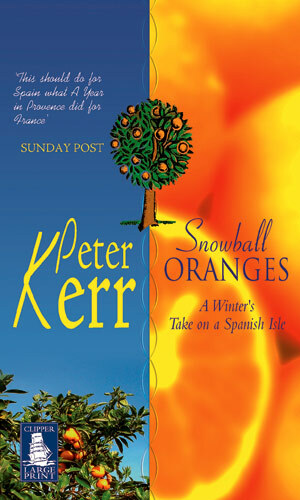 This award-winning book, first published in 2000, launched the best-selling series charting the Kerr family's often-hilarious adventures after leaving Scotland to grow oranges for a living on the Spanish island of Mallorca. “Look! The weather has come from Scotland to welcome you to Mallorca,” beamed Senor Ferrer. To our new neighbour's delight and my dismay, a cold mantle of white was rapidly transforming our newly acquired paradise in the sun into a bizarre winterscape of citrus Christmas trees, cotton wool palms and Snowball Oranges. Full of life and colour, hilarious and revealing, and set against a backdrop of the breathtaking beauty of Mallorca. you'll recognise so much of what's written." "Hilarious and revealing ... full of life and colour ... a haven of Mediterranean sunshine." "Peter's fruity tale still has plenty of juice left ... a hilarious personal account." "Readers will relish Kerr's adept account of the agricultural and social customs of the island and generous insights into one couple's bold transplanting of their lives"
"Absolutely fantastic! I haven't laughed so much for a long while." "Vividly described ... made me laugh out loud ... you just can't put it down."